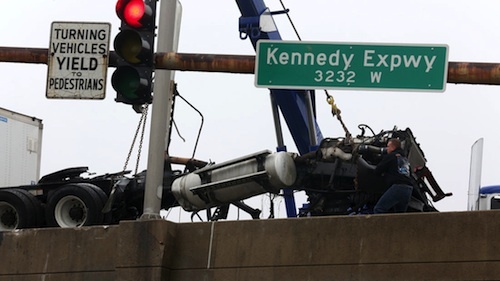 A truck driver is in serious condition after a devastating crash caused his cab to separate from the tractor-trailer and plunge off the Kennedy Expressway in Chicago. The incident occurred shortly after 8 a.m. Sunday morning on the Kennedy Expressway at the Kimball Avenue overpass, which is a busy street in the Avondale neighborhood of Chicago. 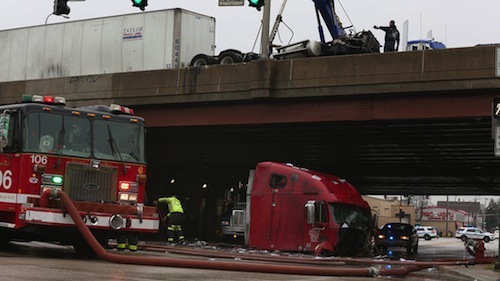 Authorities say the truck crashed into the wall of the I-90/Kennedy Expressway and the impact somehow caused the cab portion of the truck to separate from the tractor-trailer unit and then jump the concrete barrier, plunging more than 15 feet onto the street below. The rear of the truck was left dangling over the ledge. Thankfully a few fast acting witnesses immediately ran to the driver’s aid and pulled him out of the cab. They stayed with him doing what they could until paramedics arrived minutes later and rushed him to Illinois Masonic Medical Center. George Tofan was driving along the Expressway with his son when they say they saw the accident unfold. “I never see something like this," Tofan said. "I was worried about the guy that was in the truck." While the driver’s name has not yet been released, he was last reported to be in serious-to-critical condition but is he is expected to survive the accident. 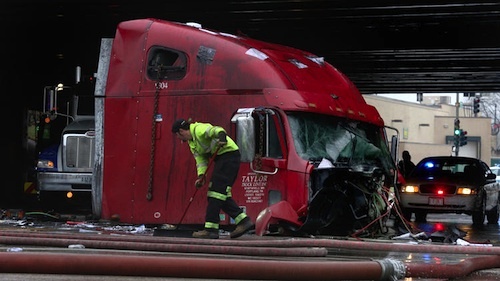 The trailer was left blocking several lanes on the Expressway and traffic was backed up for hours as crews performed the difficult job of clearing the wreckage from the overpass and the street below. First responders also issued a precautionary HazMat and spent several hours hosing down the site to wash away diesel fuel that had spilled from the truck. Cranes were also called in to lift the mangled cab from the street. "Our concern is not only for the employees of Taylor Truck Line, but also the safety of the public that we come in contact with on a daily basis."